Travel from the verdant valleys of Northern India to the dramatic mountain scenery of Ladakh. What I really enjoyed about travelling with Mountain Kingdoms was the smooth organisation, the variety of accommodation and the fantastic road journey to reach Leh. Mountain Kingdoms provided a 'cushion' to us less experienced in the adventurous way of travel, through excellent preparation, full information and a great tour leader. There was a fair mix of experiences. This is a trip of great contrasts and cultural interest. To travel from the Indian lowlands up to Leh in its high eyrie involves a fantastic Himalayan road journey on the road link between Manali and Leh, open only for a few months each year due to snow on the passes. The four day traverse takes you right across the Greater Himalaya and offers some grand scenery. You cross many high passes which offer panoramic views of the Himalaya with, in the far distance, the peaks of the Karakoram. Even before you start your road journey through the Himalaya you will be immersed into the frenetic pace of life that is India. You will stay in a 4* ‘colonial’ hotel of great Raj character in Delhi, experience the hurly-burly of an Indian railway station (Delhi Railway Station is a cultural experience all of its own), and travel by train across the Indian plains. You then take the ‘Toy Train’ up to historic Shimla in the foothills of the Himalaya, where you will stay in the famous Clarkes Hotel, long known for its charm and colonial elegance. You continue to the old hill station of Manali before setting off on your journey over the mountains to Leh. Finally, having crossed the Himalaya you arrive in Ladakh and driving up the Indus valley you arrive at the town of Leh. Here you will explore this picturesque capital and then visit further afield to old palaces and some of the large and thriving Buddhist monasteries of the Indus valley. You will then drive westwards towards Kashmir to visit the fabulous temples of Alchi. It is amazing to think that these incredible temples have survived undamaged for a thousand years! You then make the exciting drive up the Zanskar River gorge to visit the metal-working village of Chilling where you will have lunch in a local house and have some time in the village to give you contact with the local people. A highlight of each departure is the opportunity to attenda local Festival. The July departure attends the Hemis Festival and the August departure visits the Dakthok Festival. These celebrations are very colourful and atmospheric events. Local people come from villages and hamlets all around the region to watch the ‘Black Hat’ dancers, meet their relatives and friends, gain merit and improve their karma, perhaps look for a bride or a husband, and generally enjoy themselves. Such Buddhist festivals are great fun and offer great photographic opportunities. The trip finishes with one of the world’s most sensational scheduled flights, right over the top of the greater Himalaya and back to Delhi where you will have a tour round some of the most interesting sights. The July departure attends the Hemis Festival. The August departure attends the Dakthok Festival. Meal arrangements: Bed and Breakfast in Delhi, all meals included elsewhere. Train to Kalka and ‘toy train’ to Shimla. Sightseeing and walks in Shimla. Drive to Manali and Keylong. Acclimatisation in Keylong and drive to Jispa. Drive to Sarchu and continue to Leh. Attend a festival. Sightseeing in Leh. Full days sightseeing in Leh Valley with lunch in Stok. Visit Phyang with optional valley walk. Drive to Nimmu. Visit Chilling, Alchi, Likhir and Basgo. Return to Saboo. Fly to Delhi and to London. Day 1 - Fly from London to Delhi. Depart London for the overnight flight to Delhi. Day 2 - Arrive Delhi. Group transfer to hotel. Rest of the day at leisure. You will arrive in Delhi in the morning and will be met and transferred to your hotel. You may then rest until lunchtime. The hotel we normally use has a very nice swimming pool in a garden where you will see parakeets flying about. Although Delhi can initially still be quite culture shock with its heat, dust and frenetic activity, it is also nowadays a vibrant and cosmopolitan modern city with thriving business areas, an excellent metro system and plenty of reminders of its vibrant history and ancient civilization. There is plenty to see and In the old town you might visit the Friday mosque and Delhi Fort, an amazing Moghul fortress and palace, or Chandni Chowk the old bazaar. In New Delhi there are Lutyens' impressive buildings created to celebrate New Delhi as the capital of the Raj and the British in India. Overlaid onto this history is the modern infrastructure created for the Commonwealth Games; completed rather late, but hauling Delhi firmly into the 21st century. Day 3 - Train to Kalka - 4hrs and then ‘Toy Train’ to Shimla, 2,276m/7,467ft - 4-5 hours. You will transfer to the railway station to take the mainline train across the Indian plains to Kalka. In Kalka you will connect with the 'Toy Train' for Shimla. This is a narrow gauge railway, built in over one hundred years ago, and it is said to be one of the most beautiful railways in the world. Views along the way are stunning and the scenery is enchanting. In Shimla you will be met and taken to Clarkes Hotel. Day 4 - Full day of sightseeing and walks in Shimla. The town of Shimla came into being in the first quarter of the 19th Century and some forty years later became the summer capital of the British Raj, as a place where British administrators and military and their families, could escape the stifling heat of the plains. Nowadays it is the capital of the Indian state of Himachal Pradesh. Shimla is set along a ridge, with steep forested hillsides falling away in all directions and offering spectacular mountain views. Its famous Mall, with its many shops, cafes, restaurants and book shops, runs east and west just below the spine of the ridge. South of the Mall the maze-like alleys of the bustling bazaar drop steeply down to Cart Rd. Today you will have the day to explore Shimla with a guide. Your walk will start at Vice Regal Lodge (now housing the Indian Institute of Advanced Study), with a tour of Vice Regal Lodge, which will take about 30/45min. You then continue your walk on the ridge towards the Mall, which will take about 1 to 2 hours with good views of the Himalaya and rolling hills of Shimla along the way. You will also see many other historical building dating back to the Raj, such as historic Christ Church and the State Museum. You will have a good Himachali lunch at the Ashiana Restaurant, which offers fine views of the Mall on one side and the ridge on the other side. After lunch, you will continue your walk through the colorful bazaar on the Mall road towards Chota Shimla and finish the walk at Hotel Woodville Palace for high tea in the garden! Day 5 - Drive from Shimla to Manali, 1,960m/6,430ft - 9 hours. Although long, this is a very picturesque route. Firstly it is about 78 kms to reach the Beri junction, where you join the main Chandigarh to Manali road. About 145 kms from Shimla the road joins the valley of the Beas River which it then follows, through the busy town of Kullu, before finally arriving at Manali. The town of Manali, once a trading outpost at the start of an ancient trade route to Ladakh, is now the jumping off spot for the road to Leh and is also very popular with Indian tourists looking for a taste of the Himalayas. Set in the beautiful Beas Valley and surrounded by mountains, this once quiet village has transformed in recent years into a bustling resort town with numerous hotels, cafes and restaurants. Day 6 - Morning free in Manali. Drive to near Keylong, 3,050m/10,006ft - 10 hours. After a ten minute walk to Hadimbu Temple, you make a short drive to two monasteries in the town and also make a visit to the hot spring baths at Vashist. You start your drive to Leh, crossing over your first pass of the trip the Rhotang La, 3,978m/13,051ft. This pass featured heavily in the early exploration of the western Himalaya and gives excellent panoramic views of glaciers and the high peaks. A picnic lunch is usually taken at Mahli, 3,405m/11,171ft, 17km before the pass, but where you have lunch depends on whether there are any delays on this narrow mountain road which follows the mighty River Chandra for the last 60km. From here you drop into the region of Lahoul before reaching Drilbu Retreat, Tupchiling, 3,050m/10,006ft, 7km short of Keylong. Day 7 - Acclimatisation walk to monasteries in Keylong area. Drive to Jispa, 3,141m/10,305ft - 1 hour. Today is kept aside as an acclimatisation day. There are a number of different temples and monasteries that can be visited from Tupchiling and you may also have the chance to visit the capital of the Lahoul region, Keylong at 3,349m/10,987ft. Lahoul is still quite green, with barley and potato fields edged with poplar and willow trees, but already the high peaks are screening out the monsoon rains and it feels now like high mountain country. We suggest two short walks in the Keylong area to help you become more accustomed to the rare air of the Himalaya before crossing the highest passes. The first walk is after a 6km drive for a slow 30 minutes up (150m/492ft climb) to the 11th Century Khardong Gompa, the oldest in the region, returning to the transport to drive 20km, crossing the Bagrha River for an hour's walk up, 350m/1,148ft above Keylong, to the 16th Century Sashur Gompa. Each gompa can be seen across the valley from the other. You then drive a further 25km to the Ibex Hotel where you will spend the night. 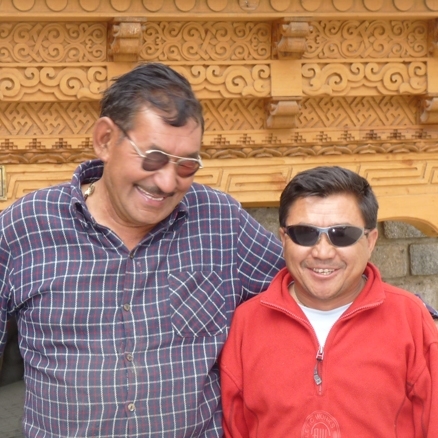 Day 8 - Drive to Sarchu, 4,220m/13,845ft - 6 hours. After Jispa you cross the formidable Baralacha La, 4,891m/16,046ft, source of the Bagrha River which you saw joining the Chandra River near Tupchiling yesterday. You enter a much more arid, sparsely populated stretch. There are one or two lakes and impressive canyons and huge plains. Some stretches of the road beyond Lahoul and up until the Indus Valley are non-metalled and, in parts, may be quite bumpy. Stay at Sarchu fixed camp. The camps that you use on this drive are semi-permanent to cater for traders/travellers on this important highway and have been set up by enterprising locals. They have large walk-in sleeping tents with camp beds and adjacent bathroom/toilet facilities. There will be a big mess tent and plenty of good food. Day 9 - Drive to Saboo near Leh, 3,505m/11,500ft - 10 hours. You will make an early start to go over the highest passes today; 21 loops with hair pin bends and a 477m/1,565ft climb to Nakella La, 4,739m/15,547ft, the Lachulang La, 5,065m/16,616ft and 90km and 3½ hours later (including crossing 48km of the More Plains) the Taglung La, 5,441m/17,852ft - this has a sign stating it to be the second highest motor-able pass in the world. On the drive you will have wonderful views of canyons, pinnacles with boulders balanced on their tops and other geological wonders. You descend to join the Indus at Upshi, 3,384m/11,102ft. You drive alongside the River Indus, following the river downstream, passing on the way some of the monasteries that you will be visiting later, continuing for a further 50km or so to reach Saboo village, a very pretty and fertile spot, located off the main highway and just a short distance from Leh town. It is quiet and secluded and a real oasis among the otherwise rather stark landscape. The village is made up of traditional village houses which are surrounded by cultivated fields, and bubbling streams run through groves of poplar trees and willows. There are wonderful views of the mountains including the Stok Kangri range from here. The Saboo Resort where you will stay is a lovely resort hotel built in traditional style. Ladakh, often known as 'Little Tibet', is the highest and most remote region of India. Its landscapes are more like Tibet and culturally too, Ladakh has more in common with Tibet than with India. Lying north of the main Himalaya chain, like Tibet it receives relatively little rainfall which means that unlike much of the Himalaya, the summer months are a good time to visit. Ladakh's wonderful if arid mountain landscapes, many palaces and monasteries and its distinctive cultural heritage make it a fascinating area. The rather stark landscape is relieved by numerous oases of green, where sparkling streams tumble through groves of willow trees alongside villages of traditional flat-roofed brick houses. The distinctive monasteries and gompas are still central to the lives of the Ladakhi people and illustrate the deep Tibetan Buddhist heritage of the region. Day 10 - Visit local festival and sightseeing in Leh. Today you will visit a local festival and should also have time for some sightseeing in Leh. Leh was the capital of the ancient kingdom of Ladakh. The Kings of Leh once commanded a huge civilization stretching from Baltistan in the west, almost as far as Lhasa in Tibet. Leh is full of interest with its semi-ruined Potala-like palace and in the old town a maze of narrow streets, filled with shops, several temples, a mosque and bustling bazaars. It is a great place to explore. Within about an hour's walk you can reach outlying villages and other Buddhist monasteries. The Tsemo Gompa dominates the town, 3,780m/12,401ft, and it is a 30 minute walk and a 200m/660ft climb up steps to reach it. Your local guide will arrange with you how best to fit in your sightseeing in Leh town with a visit to a festival. Ladakhi festivals are very colourful and cheerful affairs with dances and plays performed by masked lamas, representing the triumph of good over evil. People from all over the region flock here in their best clothes to celebrate, achieve religious merit and to socialize. These festivals are always great fun to attend and you can expect large crowds of local Ladakhis to be there in all their finery. On the July departure you will visit the Hemis festival, one of the most popular festivals of Ladakh, commemorating the birthday of Guru Padmasambava, the founder of Tantric Buddhism in Tibet. The monks dress in colourful brocade robes and wear masks to perform a sacred dance drama of the Guru's life and achievements. On the August departure you will visit the Dakthok festival, another major festival of Ladakh and always well attended by visitors and locals alike, and featuring masked dances by lamas. For your sightseeing in Leh a knowledgeable English-speaking guide will take you on a walking tour of the town. You will see the backstreets, bazaars and temples of Leh as well as the Royal Palace which dominates the town. The tour will give you a real sense of the mediaeval character of Leh town before the advent of the modern age. At the ecological centre you will discover from various exhibits how a relatively fragile Ladakhi culture is being threatened by a rapidly changing outside world. You might also relax in town at a rooftop café, or do a bit of shopping - Leh has some good bookshops. Later you may walk the short distance up to Shanti Stupa for the great views from there. It's a bit of a heave up the many steps to reach the top but you will be rewarded with incredible views over Leh town and the surrounding countryside. Day 11 - Full day of sightseeing in the Indus Valley. Leh and the Indus Valley are surrounded by the mountains of the High Himalaya and many snow peaks such as Stok Kangri are visible from town. The Indus Valley cuts a wide swathe through these mountains and the various valleys which come down from the high mountains to meet this main valley are cultivated and fertile in their lower reaches with distinctive ancient palaces and monasteries watching over the villages and fields below. You will spend the day visiting three or four of the more spectacular and important places in the Indus valley east of Leh. Firstly you drive to Hemis Monastery which stands above the Indus River, approximately 47 kilometres from Leh. This monastery dates back to 1630 is the largest and is the most wealthy monastery of Ladakh. It belongs to the Drukpa Lineage, or Dragon Order, of Mahayana Buddhism. You then visit Thikse Gompa, perched on a hill high above the Indus, and considered one of the most splendid of all Indus valley gompas. This gompa contains a three storey high statue of Chamba, Buddha of the future and has marvellous views of the valley from the roof. It has the largest contingent of monks in Ladakh. On the right of the entrance to the main courtyard a new chapel houses an enormous 15 metre high figure of Chamba, Buddha of the Future. About 100 yellow-cap monks belong to the gompa. If you get there by 6.30am you can witness the daily morning prayers, but there are also prayers closer to noon, preceded by long, mournful sounds from the horns on the roof. Retracing your steps, you will visit Shey Palace, the palace of the old Ladakhi Kings. The old 'summer palace' of the Kings of Ladakh was built about 550 years ago by Lhachen Palgyigon, the first King of Ladakh. It stands next to the remains of a larger construction on the east side of a hill, which runs south east towards the Indus. From the palace you can see over the fertile Indus plain north east to Tikse Gompa and over the Indus to the Zanskar mountain range. The old Shey Palace has the largest golden Buddha statue in Ladakh in its gompa. The statue worked out of gold and gilded copper sheets, stands 12 metres high and has blue hair. It was erected by King Dalden Namgyal in the middle of the 17th Century. The most important moment in the construction of such a figure is when the eyes are painted in and the statue can 'see'. No artist or monk would dare to look the Buddha in the eye so the pupils are painted over the artist's shoulder, with his back to the idol, using a mirror. Later you travel to Stok, a lovely village with fertile fields, overlooked by Stok Palace. In Stok village you will enjoy the hospitality of a local family and have lunch in the lovely dining room/kitchen at the Gyab Thago Heritage Home. The family who live here built this relatively new house, but set just above it, is their old home, an ancient house no longer lived in. You may visit this house after lunch where you will see the traditional layout of a Ladakhi home, with accommodation for the animals downstairs, and upstairs the kitchen with its central fire and the walls lined with all sorts of pots and old utensils. There is the store for keeping barley during the winter months and a prayer room, while up on the roof is a sheltered space where the family could sit in the sunshine out of the wind during the cold winter months. After lunch you will visit the palace of Stok, built in the 1840s to house the Ladakhi Royal family the King of Ladakh was allowed by the Kashmiris to move here after they invaded in 1837. A visit to Stok Palace is a step back in time; the family still live here and run it as a small guesthouse with a couple of rooms. There is also an excellent museum which has a remarkable display of royal memorabilia and many fine 'thangkas' (Buddhist religious paintings) along with traditional Ladakhi clothing and jewellery. Much of this collection formerly belonged to the Ladakhi royal family, including the queen's spectacular turquoise headdress, along with the wooden case in which it was carried. Day 12 - Visit Phyang and optional walk in valley. Drive to Nimmu. Today you will drive west along the Indus before turning north up a valley to visit the spectacular Phyang Monastery which like so many such buildings is set on a hill overlooking the valley. Phyang is one of the very important monasteries of the Indus Valley but tends to be less visited than those to the east of Leh. It is believed to date back to the 16th century. It is one of the few monasteries belonging to the Kagyu-pa sect of Buddhism and it houses some magnificent paintings and images. You might also like to have a bit of a leg stretch today with a very pleasant and quiet walk up the valley above Phyang. From the end of the tarmac road a trail leads up the valley, rising high above the village and entering a harsher, more alpine landscape. Wild thyme scents the air and you may see butterflies flitting over the low bushes and occasionally birds and animals such as hares, blue sheep and ibex. You may also encounter mule trains and descending trekkers, for this is a trekking route coming over a high pass from Hundar in the Nubra Valley. Later you will drive to the village of Nimmu, close to the confluence of the Indus and Zanskar rivers. Nimmu is a picturesque village featuring houses of traditional Ladakhi architecture surrounded by orchards of apricot, apple and walnut trees. You will stay here for three nights at the Nimmu House Hotel. Nimmu House was formerly home to a cousin of the king of Ladakh and has been tastefully converted into a unique heritage hotel. You will have the afternoon at leisure in Nimmu with the opportunity to take a gentle walk round the village to visit the ancient monastery, an old caravanserai and Nimmu's orchards and gardens, where you will meet local villagers working in the fields or beside their houses. Day 13 - Drive to Chilling, 3,350m/10,990ft. After breakfast, you will drive along the banks of the Zanskar River and follow the winding road beneath steep cliffs up the river valley toward Chilling. Below Chilling you leave the vehicles and climb up the narrow footpath into the village itself. Chilling is famous throughout Ladakh for all manner of traditional metal handicrafts, which are the pride of every Ladakhi kitchen, in particular for beautiful items such as ladles, spoons, prayer wheel, teapots and also for their ornate stoves. The people of Chilling have a great reputation for their traditional skills in working copper, bronze, tin, silver and iron and believe themselves to be descended from Nepalese craftsmen brought to work for the King of Ladakh in ancient times. You will be able to visit their showrooms and see some of the craftsmen working in these traditional home industries. There are some nice day walks around Chilling and the gorge scenery is awesome. You will have lunch with a local family and then return to Nimmu. Day 14 - Visit Alchi and Likir. Return to Saboo via ruined castle at Basgo. Today you make the short drive to Alchi, a pretty village set in picturesque apricot orchards above the river Indus and having one of the most ancient and attractive temples of this entire region. A visit to Alchi is a step back in time. Alchi temple has somehow miraculously survived war and earthquake relatively intact for over 1,000 years. Its stunning frescoes are said to be among the best-preserved examples of Buddhist art from this period to be found anywhere. These wall paintings are in a different style to those you will see in other monasteries of the Indus Valley - their style is said to be more Indian or Indo-European. The various chapels which make up the complex, house a stunning array of magnificent images, wood carvings, stucco art and statues. The sheer artistry and originality found at Alchi sets it apart from other monasteries and makes a visit there unforgettable. After your visit to Alchi you will drive to Likir. From Alchi you return to the main highway and turn east towards Leh. You then turn off the main Leh road to drive up a short way north to Likir. Likir Gompa is a very ancient monastery dating back in part to the 11th century. It sits majestically on a hill top dominating the valley and is attractively set amongst running water and willow trees which make a pleasant contrast to the surrounding barren landscape. Likir is famous for its imposing 25m high golden figure of the Matraiya Buddha, which sits behind the gompa looking towards the east. You may take time to explore the many finely decorated halls and temples. The gompa also contains a small museum with a very interesting collection. Returning towards Leh, you can also visit Basgo. Basgo is known for its ruined castle dating from 15th century and the adjoining royal temples spectacularly located on cliffs above the valley floor. You then drive back to Saboo for your last night in Ladakh. Day 15 - Fly to Delhi and on to London. An early start for the short drive to the airport for one of the most sensational flights in the world! Within minutes the aircraft flies over a sea of ice-cold peaks and glaciers as it crosses the Greater Himalaya range. On one side can be seen in the distance the peaks of possibly K2, Nanga Parbat, Gasherbrum and on the other side, so close that you feel you could reach out and touch it, is the Nun Kun massif. On arrival in Delhi you will transfer to International Departures to check in for your flight to London.